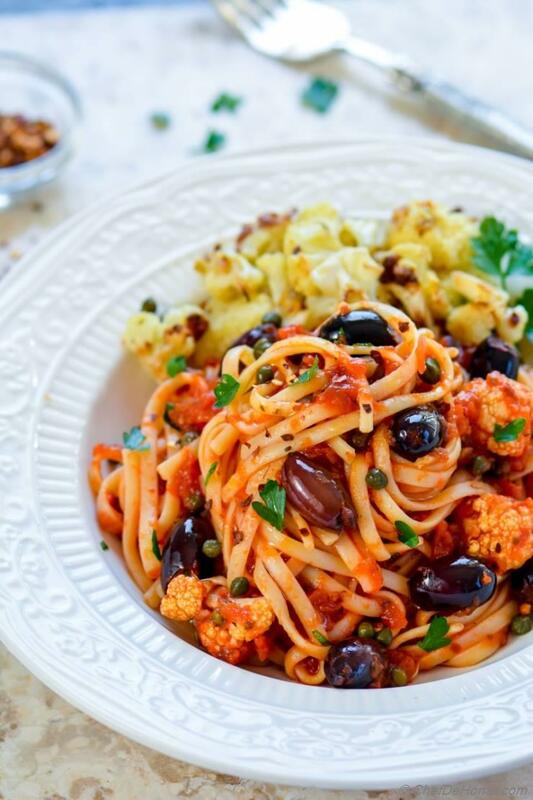 Pasta Puttanesca - herbaceous Italian-staple spiced tomato and olives sauce pasta, served vegan with roasted cauliflower. A complete weekday dinner, ready in just 30 minutes start to finish! Also including instructions to make Puttanesca Sauce in advance. 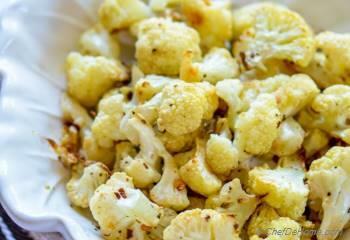 With sauce already ready, all you have to do for dinner is - boil some pasta and roast some cauliflower! Sounds easy? Oh, and you can replace cauliflower with any protein of your choice! My family favorite is - Roasted Shrimp! The best thing about Puttanesca Pasta Sauce? 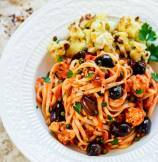 It needs just easy to find pantry pasta sauce ingredients like tomato, garlic, olive oil, oregano, and basil....... and some olives (quintessential Puttanesca tastemaster). Traditional preparation also calls for anchovies paste but I have kept this pasta vegan and have used salty capers to add that brine-y flavor. Puttanesca sauce origins from Naples Italy. It literally means "pasta garbage style". 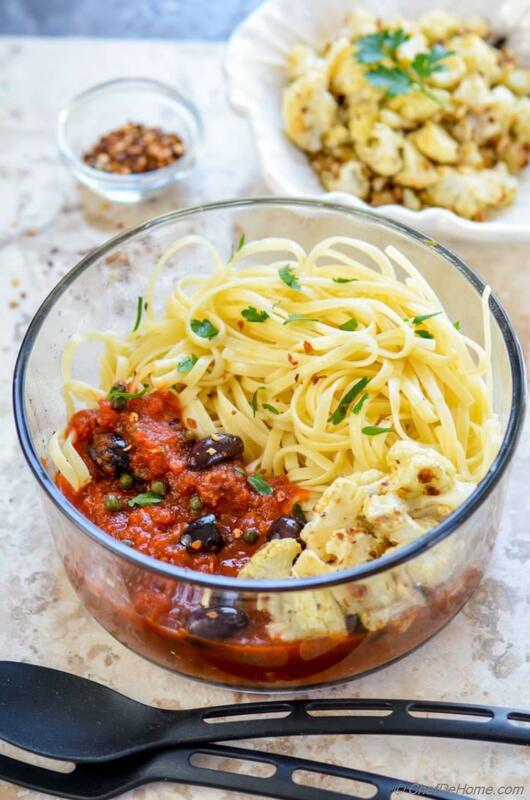 Made with classic Italian everyday leftovers like tomatoes, olives, anchovies, chilies and big batch of Italian-favorite Spaghetti! I, however, have not used anchovies in the Puttanesca Sauce and has served the sauce over linguine pasta. I'm sure you wonder, how do I know about Puttanesca Sauce so much?! Do you really? Even if you don't, I would like to tell you ;-) I first had Pasta Puttanesca during our visit to Solvang - a Danish village near Santa Barbara. 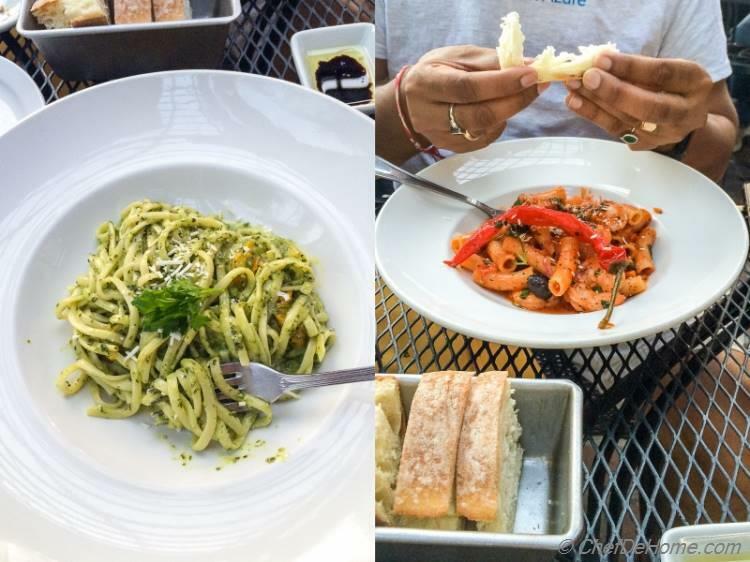 Actually, first time, Vishal ordered Shrimp Pasta alla Puttanesca and I ordered Pesto Cream Pasta. Even though their Pesto Cream Pasta is also worth a mention and I did made a lot of batch after coming home and have shared a recipe with you too..... Vishal's order came topped with Clabrian Chili and was so fragrant that I kept drooling sitting across the table. After hostess served the pasta, I was just lost in it. Tasting every bite carefully with full intent to make it at home! soon! 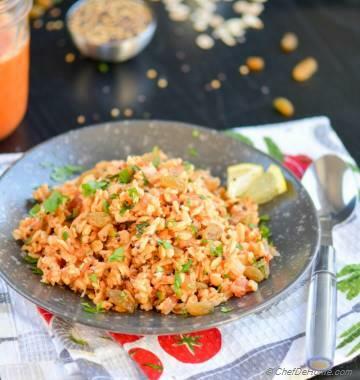 :) It's amazing how brine-y capers, olives, oregano, and chili flakes change the flavor profile of a basic tomato sauce.... every bite meant to savour! You know the best part? That much flavor and still this Italian Staple has no cheese! I even skipped anchovies and shrimp to keep it completely vegan. How good does that sound? It's baking season guys!! So I could not resist adding some roasted cauliflower to make a hearty Pasta Dinner. Feel free to use any protein of your choice. If you eat meat, roasted shrimp or turkey will also be perfect for a hearty weeknight Pasta Dinner! 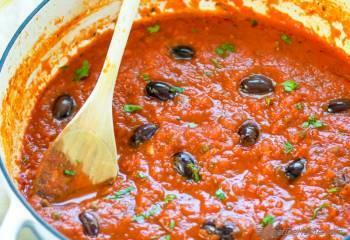 Make Ahead - Puttanesca sauce can be prepared a week in advance. Just remember to store in an airtight container in refrigerator. Smart Swap Replace cauliflower with your choice of protein. Roasted Shrimp or Turkey will be great. 1. Peheat oven at 450 degrees. 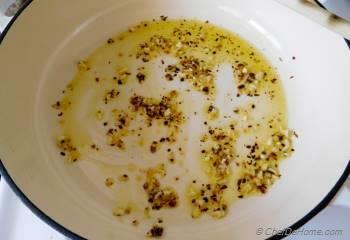 in a bowl, add cauliflower florets, oil, garlic, pepper flakes and salt. Toss well, then spread on baking sheet lined with parchment. 2. 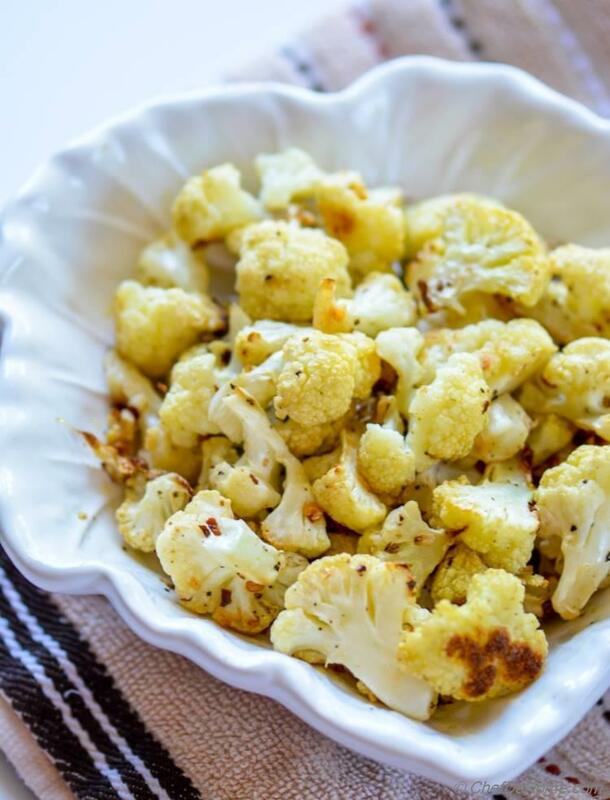 Roast cauliflower for 15 minutes or until florets are golden and tender. Remove from sheet and transfer to a bowl. Set aside. 3. Heat 2 tbsp oil in a wide pan. Add onion flakes, garlic, and red paper flakes and cook until shimmering hot (1 minute). 4. Add tomatoes, capers, oregano, basil, sugar, and salt. Mix well and bring to simmer. Reduce to medium heat, cover and simmer for 10-12 minutes. Add in olives. Mix, taste and adjust salt. Remove from heat, cover and set aside. 5. While sauce is simmering, bring a pot of water to rolling boil. Season with salt. 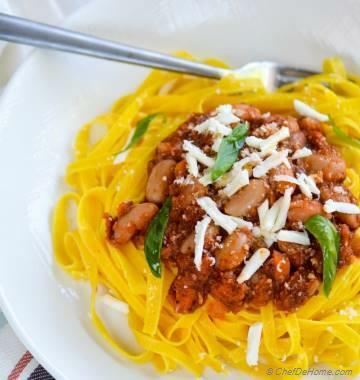 Add spaghetti or linguini, cook until al-dente or as per package directions. 6. Once pasta has cooked, add paste in sauce with half of roasted cauliflower, and 2-3 tbsp of pasta water. Coat well. 7. Transfer to serving plate. 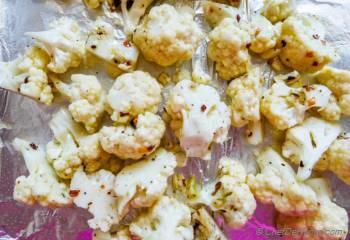 Top with remaining roasted cauliflower diving equally among plates. Serve and enjoy! 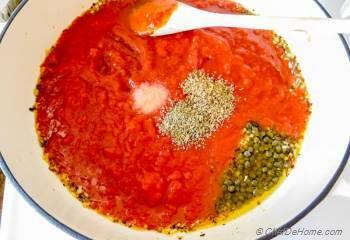 Make Ahead - Puttanesca sauce can be prepared a week in advance. Make sure ingredients used are not close in their expiry date. Store sauce in an airtight container in refrigerator. Cook pasta and roast cauliflower just before serving. wow I have never tasted this pasta sauce, sounds so flavorful! I think I will have to make it all for myself because Sarvesh won't eat olives! 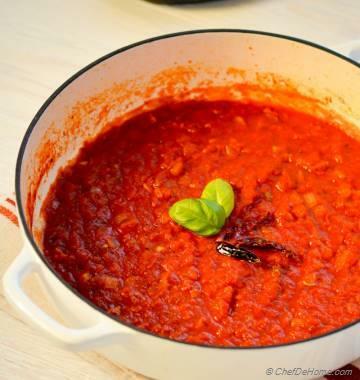 Manali, this pasta sauce is a MUST try! I know you will love it. 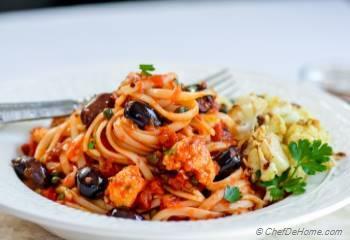 Olives are imp for this recipe. 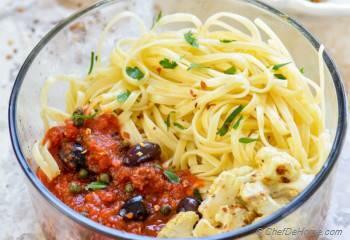 If not olives, use capers for sure. I hope you like it when you try.